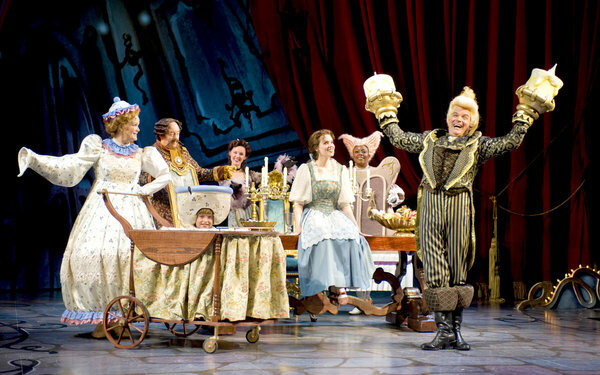 It’s clear, based on yesterday’s sold-out performance of Disney’s Beauty and the Beast, that Chicago Shakespeare Theatre has a hit. From the moment Belle (the charming Emily Rohm) comes strolling down the aisle singing that well-known passage (“Little town, it’s a quiet village…”), kids of all ages in the intimate Chicago Shakespeare Theater marveled at the talent and stagecraft in this exceedingly high-quality production. This is my fourth time seeing this musical onstage. The previous two times were a non-Equity tour that had its moments, but was mostly a flimsy memory of the original 1994 Broadway production. At ChiShakes, we have a wholly original production directed and choreographed by the amazing Rachel Rockwell, who has a knack for injecting wit and heart into all she touches, filled with a top-notch cast of well-respected Chicago actors. Scott Davis’ evocative scenic design uses curtains and projections (designed by Mike Tutaj) to move the action and multiple scenes along with fluidity. In addition, the show has been smartly whittled down to 70 minutes, so squirmy kids’ attention spans aren’t taxed too much. That said, all the moments you’d expect in Beauty and the Beast are intact (including the kick line and magical special effects), but with less fat. Most amazingly, tickets are only $18 for children 12 and under, so it’s a great deal. This is children’s theatre that’s smart, professional and thrilling for all ages. This entry was posted in Arts/Culture/Entertainment, Family, Theater and tagged chicago, Chicago Shakespeare Theater. Bookmark the permalink. Hi Bob! I’m the family fun writer over here at Chicago Like a Local. We LOVED this production of Beauty and the Beast! My 2-year-old and her 4 year-old friend were enthralled! Even I found myself laughing out loud (Gaston was a riot!). Hey there! Wasn’t it a great time? I particularly loved watching the kids around me watch the show — the magic of live theatre was truly alive!